Explanation: What's happening over the horizon? Although the scene may appear somehow supernatural, nothing more unusual is occurring than a setting Sun and some well placed clouds. 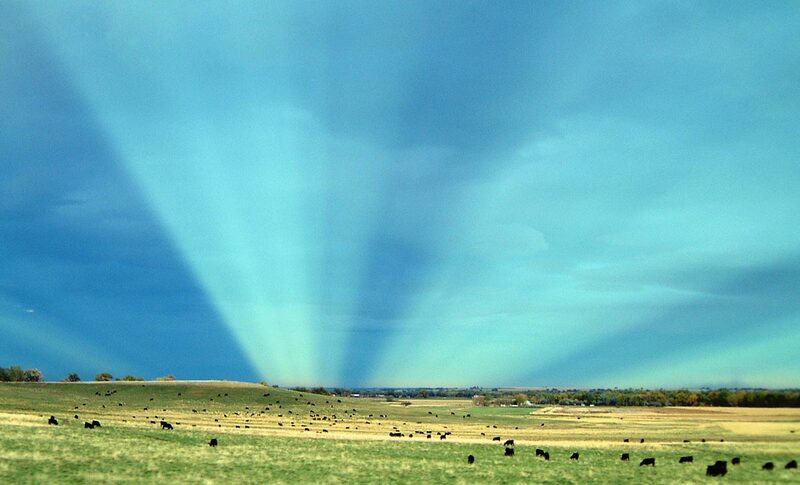 Pictured above are anticrepuscular rays. To understand them, start by picturing common crepuscular rays that are seen any time that sunlight pours though scattered clouds. Now although sunlight indeed travels along straight lines, the projections of these lines onto the spherical sky are great circles. Therefore, the crepuscular rays from a setting (or rising) sun will appear to re-converge on the other side of the sky. At the anti-solar point 180 degrees around from the Sun, they are referred to as anticrepuscular rays. Pictured above is a particularly striking set of anticrepuscular rays photographed earlier this month from a moving car just outside of Boulder, Colorado, USA.